Conferences are respectful when parents, teachers, and students are all included. The Parent-Teacher-Student conference provides an opportunity to create a connection between home and school. In what areas would improvement be beneficial? What kind of encouragement is needed to support learning from mistakes as well as for improvements? During the conference ask all participants to share what they have written. Let the student share first. As a teacher and school counselor I experienced again and again how helpful it is to include students in conferences. It provides an opportunity for students, teachers, and parents to check-in and collaborate on how to support what is going well and what may need improvement. Students feel encouraged through the process. These conferences are also a great opportunity as a teacher to experience a sample of your student's family communication styles and dynamics that may provide insight or helpful information. My first year teaching, I discovered how helpful it is to include students and follow the Positive Discipline Model for conferences. One of my students repeatedly did not turn in his homework. He was perfectly capable, and I couldn’t figure out why he was making the choice to get a zero for homework on a regular basis. When I met with him and his parents, I immediately saw how the student and his parents were in a pretty major power struggle. Just from seeing them interact, and hearing them talk about their son’s work—I had a hunch that “no homework” was a way for him to win. The student’s parents cared a lot that he turned in his homework on time, so not turning in homework was a way for him to have power and control. In the conference, we worked together to develop a plan where the student was in charge of his homework schedule. I asked the parents to try for just 2 weeks not to discuss homework at all, but rather let their son be in charge and see how he does on his own. I explained he had a team at school working to help him structure for success, and as a middle school student it was time for him to practice independence. In asking him,what would help you the most to get your homework done, he asked to handle it himself without being pestered. We developed an agreement that everyone felt good about trying for 2 weeks. This turned into a huge success because the student (when given the space to mange his homework himself) demonstrated his ability and started turning in his homework regularly. 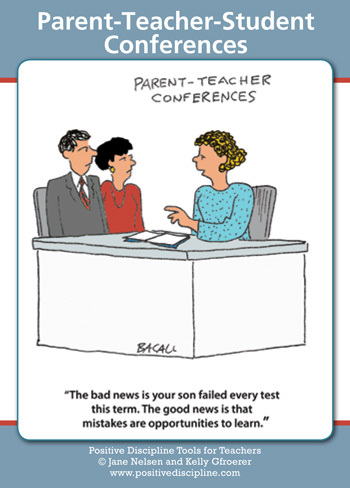 Parent-teacher-student conferences are the norm at our school. As a parent, this process has been a huge benefit for me and for my two daughters throughout their elementary and middle school years. Our twice-per-year conference sessions are student-led. Prior to the conferences, students reflect on their own learning and prepare work samples from each subject that they want to share with their families. During the conference, the students lead, sharing what they know, how they feel about their learning, their successes, and their mistakes. They set learning goals for the rest of the year. They can also share what they need from the adults around them for support. Both of my daughters really take ownership of their own learning and have a much greater understanding of what they know and what steps they can take to learn what they don’t know. As a parent, I can see their independence, pride, and motivation through their sharing, which helps to relieve any of my parental anxiety about their education.